Dad is very fond of Karivepaku podi. There was a time when Amma used to store these for everyday use. Habit changes and somehow in the line, I found we stopped making it. Kerivepillai is often so misused that its bad to think about. We use this for all our dishes but mostly they are discarded. Athamma keeps telling us to eat them instead of throwing it away! But it does become difficult to chew on them. At times I try eating it when its in coconut chutney, else normally never. I have been planning for so long to make this Karivepaku podi that I almost gave up on that. When Athamma had gone visiting her daughter during sanskranti, she brought back so much with her. I was eying that packet gingerly for a long time, wondering when I will get down making that podi. Athamma had got two huge bunches of tender leaves and little mature ones. My sil told me that Athamma had got these specially for me as I was planning on preparing something with this for a long time. How I dreamt I will prepare Karivepillai Rice or Karivepaku podi. Infact I was so obsessed with that, that I dreamt about it one day.Reasons being that hubby dear said that I am loosing my hair and I better take care of it. I have read and heard many say that curry leaves are good for hair. Well of all the reasons! Anyway even without this, I remember Amma's spiced curry powder and longed for it. I called her and asked her how to do. I told her that Athamma has got the unbelievable wonderful fresh leaves. During this season its quite hard to get good ones in the market. So her acquisition is a prized one. With all these things going on, I did the most unforgivable thing. I put the big bunch of mature ones into the freezer. I remember somewhere in the back of my mind that I shouldn't be doing it. But I don't know what happened, I just tucked in the packet and remembered about it some 5 hrs later. I ran to the freezer hoping nothing would've gone wrong with it. God, they were all weathered. They were so fresh and crisp, but within few hrs in freezer, they lost life! I was so sad and didn't know what to do. I was sure Athamma would feel bad about it, if not angry. I just tucked it back to Veg store and didn't say a word. 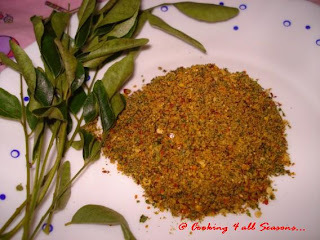 Amma asked me if I made the podi, I sadly recollected her the sad story of Curry Leaves. She consoled and said I can always get some and prepare if I was so particular. So next day send the maid to buy in bulk. Never let a word to hubby dear or Athamma about this. Finally I ended up preparing the podi. It was ridiculously simple, yet it tasted heavenly! I had it with Chappati, idli and Rice too. As it was on Amma's table, now lies a box with Spiced Curry leaf powder on mine! Wash the curry leaves and pat dry. 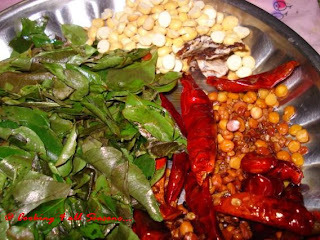 Then roast the curry leaves, till they are crisp and well fried. Let it cool. Once its ready to grind, add tamarind, Fried Gram dal, salt and all the fried ingredients into a mixie and grind to a powder. Remove and store in an air tight container. Goes very well with everything and is quite a saver. This is quite spicy, so adjust the chillies based to your palette.